Apportioning blame. Listen to my gravamen wherein I indict post-industrial austerity polices as the cause of the May 12 Amtrak Northeast Regional train derailment. But instead our media will blame the tragedy solely, solely on engineer error and negligence. He was driving the train too fast. That’s it. Nothing to see here. Move on. Blood on their hands. The National Transportation Safety Board (NTSB) is investigating the causes of the crash, but the New York Times has already quoted experts who say the derailment could have been avoided entirely if the proper safety mechanisms had been in place. The safety system mandated by Congress in 2008 for American rail included what is known as positive train controls which inter alia can automatically slow down a speeding train. The system is required to be installed on both trains and track. 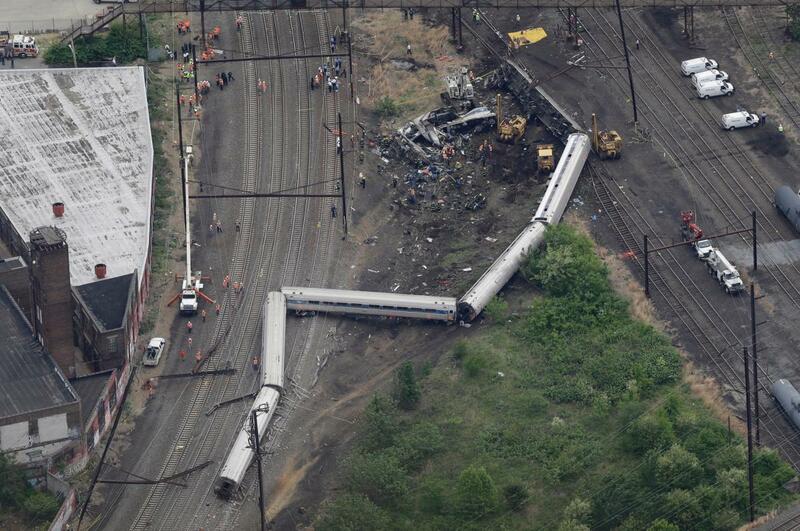 While the Northeast Regional was outfitted with the system, the track was not. I (don’t) hear that train a comin’. After WWII American railroads have slid into pathetic and dangerous decline. Used as cash cows by their corporate managers’ wanton looting and absurd travel taxes on the books until 1962, these were certainly early contributors. Richard Nixon decided to nationalize rail travel in 1970-71, which resulted in the pathetically funded and maintained Amtrak. American rail systems were out-lobbied by airline and highway interests and concerns and it lost much of its federal subsidies. Then came the positively impotent presidency of Gerald Ford whose Transportation Secretary, William T. Coleman, declared Amtrak “outmoded outhouses.” Then Jimmy Carter’s Secretary of Transportation Brock Adams abolished many of Amtrak’s most popular trains altogether. Cue Taps. China will bury us. Republicans in the House of Representatives grudgingly agreed to fund Amtrak for the next four years at a paltry rate of $1.4B a year this past March. Compare this to the Chinese government , which exhibits an enormous interest in high-speed and maglev rail. They invested $128B this year alone on rail! If the United States does not wish to become inadvertent material for the next Chinese college textbook on ancient civilizations, the need to reexamine the national interest in rail transportation is vital. And this must transcend rhetoric and the usual hackneyed reactions. Not to mention a more vigilant independent mainstream media.